» The Britishers came to India in 1600 as traders in the form of East India Company (EIC). » The East India Company had the exclusive trading rights in India granted by Queen Elizabeth (who was herself a shareholder). » Initially these rights to company was granted for a period of 15 years and later for 20 years. » These rights were in the form of charter. » These charters were granted to the company only if the interest of the crown and the people were not effected and could be terminated earlier on two years notice. » Initially, the British were busy with trade and commerce only but after the death of Aurangzeb in 1707 the British Company took some active interest in the political matters of India. » Battle of Plassey was fought between Siraj-Ud-Daula and East India Company in 1757. » The Battle of Plassey was a decisive victory of the British East India Company over the Nawab of Bengal and his French allies on 23 June 1757. » The Battle of Buxar was fought on 22 October 1764 between the forces under the command of the British East India Company led by Hector Munro and the combined armies of Mir Qasim, the Nawab of Bengal; the Nawab of Awadh; and the Mughal Emperor Shah Alam II. » The battle fought at Buxar, then within the territory of Bengal, a town located on the bank of the Ganges river about 130 km west of Patna, was a decisive victory for the British East India Company. » It let the British East India Company take control of this part of the Indian subcontinent. » The British crown passed a number of Charters (laws) and Acts to regulate the conduct of Company in India. » There are certain events in the British rule that laid down the legal framework for the organisation and functioning of government and administration in British India. » These events have greatly influenced our constitution and polity. » The Indian Rebellion of 1857 was a major, but ultimately unsuccessful, uprising in India in 1857–58 against the rule of the British East India Company. » As a result, the Parliament of the United Kingdom withdrew the right of the British East India Company to rule India in November 1858. » The United Kingdom started ruling India directly through its representative called the Governor General. » It made India a part of the British Empire. It promised "the Princes, Chiefs, and People of India," equal treatment under the British law. » The Government of India Act 1858 was an Act of the Parliament of the United Kingdom (21 & 22 Vict. c. 106) passed on August 2, 1858. Its provisions called for the liquidation of the British East India Company (who had up to this point been ruling British India under the auspices of Parliament) and the transference of its functions to the British Crown. » Other Acts Passed by British Parliaments were: Indian Council Act of 1861, 1892 and Government of India Act 1919. » In 1877, Queen Victoria took the title of Empress of India and the Viceroy of India ruled India for her. » In 1927 M.N. Roy and in 1933 Motilal Nehru had demanded a constituent assembly whose members would be elected on the basis of adult franchise. » In 1935 Indian National Congress made a demand that the people of India should have the right to frame their own constitution. 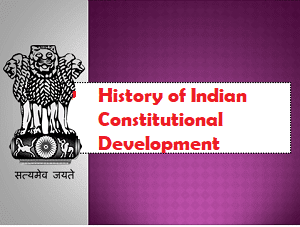 » In 1940, the British for the first time accepted that the Indian should themselves frame a new constitution for autonomous India. » Cripps Mission was sent by the British Government in March 1942 to India with key objective to secure Indian cooperation and support for British War Efforts. » The mission was headed by Sir Stafford Cripps, a senior left-wing politician and government minister in the War Cabinet of Prime Minister Winston Churchill. » Cripps was sent to negotiate an agreement with the nationalist leaders, speaking for the majority Hindu population, and Muhammad Ali Jinnah, speaking for the minority Muslim population. » Cripps worked to keep India loyal to the British war effort in exchange for a promise of full self-government after the war. » Cripps promised to give dominion status after the war as well as elections to be held after the war. » Indian National Congress (INC) and Muslim League both rejected the demands. » The mission proved a failure. » In the year 1944 C R Formula and in 1945 Wavell Plan came to India but they proved futile. » C. Rajagopalachari's formula (or C. R. formula or Rajaji formula) was a proposal formulated by Chakravarti Rajagopalachari to solve the political deadlock between the All India Muslim League and Indian National Congress on independence of India from the British. » On June 14, 1945, Lord Wavell announced a plan for a new Executive Council in which all members except the Viceroy and the Commander in Chief would be Indians. This executive council was to be a temporary measure until a new permanent constitution could be agreed upon and come into force. All portfolios except Defense would be held by Indian members. » Meanwhile, a general election had been held in the United Kingdom in July 1945 which had brought the Labour Party to power. The Labour party wanted to transfer power to the Indians as quickly as possible. The new government sent the Cabinet Mission to India and this proved to be the final nail in the coffin of the Wavell Plan. » After tremendous efforts of the Indians some success in this regard was achieved under the cabinet mission plan of 1946 which suggested the setting up of a constituent assembly. 1. Sir Pethick Lawrence, Secretary of State for India. » Lord Wavell, the Viceroy of India, did not participate in every step but was present. » The Mission held talks with the representatives of the Indian National Congress and the All-India Muslim League, the two largest political parties in the Constituent Assembly of India. The two parties planned to determine a power-sharing arrangement between Hindus and Muslims to prevent a communal dispute. » The Congress, under Gandhi and Nehru, wanted to obtain a strong central government, with more powers than state governments. The All India Muslim League, under Jinnah, wanted to keep India united but with political safeguards provided to Muslims like parity in the legislatures because of the wide belief of Muslims that the British Raj was simply going to be turned into a Hindu Raj once the British departed, and since the Muslim League regarded itself as the sole spokesman party of Indian Muslims, it was incumbent upon it to take the matter up with the Crown. After the initial dialogue, the Mission proposed its plan over the composition of the new government on 16 May 1946. In its proposals, the creation of a separate Muslim Pakistan was rejected. » In the meantime in July 1947, the British Parliament passed the Indian Independence Act 1947. » The Indian Independence Act was based upon the Mountbatten plan of 3rd June 1947and was passed by the British Parliament on July 5. » The Indian Independence Act 1947 (1947 c. 30 (10 & 11. Geo. 6.)) is an Act of the Parliament of the United Kingdom that partitioned British India into the two new independent dominions of India and Pakistan. The Act received the royal assent on 18 July 1947, and Pakistan came into being on 15 August at the same time as Indian independence. However, due to Viceroy Lord Mountbatten's need to be in New Delhi for the transfer of power, Pakistan celebrated its formation a day ahead on 14 August 1947 to enable him to attend both events. » The legislation was formulated by the government of Prime Minister Clement Attlee and the Governor General of India Lord Mountbatten, after representatives of the Indian National Congress, the Muslim League, and the Sikh community came to an agreement with the Viceroy of India, Lord Mountbatten of Burma, on what has come to be known as the 3 June Plan or Mountbatten Plan. This plan was the last plan for independence. » On the midnight of 14-15 August 1947, a special session of Constituent Assembly was held to effect a formal transfer of power.